MASSEY FERGUSON: Electronic ignition conversion kit. Replaces points & condenser with an electronic module. Use on the following tractors with 12-volt negative. JOHN DEERE: Electronic ignition conversion kit. For tractors: 3010, 3020 with 12-volt negative ground system. For engines: 201, 227, 241. Delco distributor Part # 1112623, 1112648, 1112474. ALLIS CHALMERS: Electronic ignition conversion kit. For tractors with 12 volt negative ground system: 170, 175. 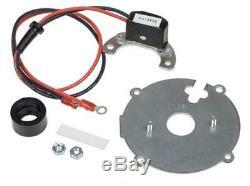 Electronic ignition conversion kit for 4 cylinder c-157 engine, AC Delco distributor, number 1112477. Or engine C-175 with distributor number 1112489, 1112697. The item "ELECTRONIC IGNITION KIT Allis Chalmers International Harvester John Deere" is in sale since Thursday, May 22, 2014. This item is in the category "Business & Industrial\Heavy Equipment Parts & Accs\Antique & Vintage Equip Parts". The seller is "justauctions" and is located in Sparta, Michigan. This item can be shipped worldwide.